Drugs and alcohol make for a dangerous combination. Unlawful drugs like cocaine, heroin, PCP, and ecstasy can be extremely dangerous when mixed with alcohol. Unfortunately, many people do not realize that prescription drugs can be just as dangerous as illegal drugs. It is not uncommon for people on prescription drugs to ignore warnings about alcohol use with a medication. If you are arrested for an alcohol and drug DUI, you should make sure to consult a Phoenix DUI lawyer. Our principal, James Novak, is an experienced criminal defense attorney who previously worked as a prosecutor and has useful insights into how prosecutors and judges think about cases. Drug and alcohol DUIs are prohibited by the same statutes. However, they are not the same thing. Unlike an alcohol breath test, a chemical test cannot determine impairment. It is difficult for prosecutors to show the relationship between a blood concentration of drugs and performance-impairing effects. The type of drug may matter. Detecting the total THC metabolites in your urine can indicate prior exposure to THC, rather than intoxication or impairment. However, the law treats drug and alcohol DUIs in the same way. A.R.S. § 28-1381(a)(1) prohibits driving or being in physical control of a vehicle while being impaired by alcohol, any drug, a vapor-releasing substance containing a toxic substance, or any combination of these. It also prohibits driving when someone has an alcohol concentration of .08 or more within two hours of having control of a car or within two hours of driving, if that concentration is a result of drinking alcohol either before or while driving. Additionally, it prohibits driving while any drug defined in § 13-3401 or its metabolite is in your body. Drugs defined under A.R.S. § 13-3401 include prescription drugs, marijuana, dangerous drugs, and narcotics. Under this law, it does not matter whether your driving was actually impaired but only that drug metabolites are found in your system. Combining drugs and alcohol can result in significant drowsiness, which makes it more likely that you will make driving errors and possibly hurt or kill someone else. It is also possible that combining alcohol and drugs will result in your passing out and becoming unconscious. This is important because under A.R.S. § 28-1321, Arizona law enforcement officers are allowed to ask for a warrantless, nonconsensual blood draw if they suspect that you were driving under the influence, and you are unconscious. However, the blood draw may be unconstitutional and the results may be inadmissible if your rights were violated in the process. This is a fact-specific analysis, and there is an exception for police acting in good faith. 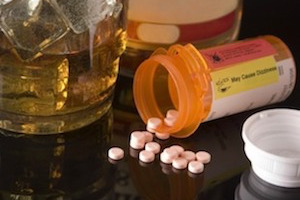 There are defenses to both alcohol and drug-related DUIs, although these defenses can be more complicated when a case involves a driver allegedly being under the influence of both substances. For example, you might be entitled to use a prescription drug that has been prescribed to you by a medical practitioner even when driving, as long as you are not impaired to the slightest degree, since a valid prescription is a defense to a drugged driving charge under § 1381(a)(3). However, you may not be able to raise this defense successfully if you have mixed a prescription drug with alcohol. For a first offense, you may face jail time, mandatory alcohol and drug treatment, a fine, a license suspension, probation, and community service, and you may need to install an ignition interlock device. The penalties for a second, third, or fourth offense are greater. Similarly, the penalties may be enhanced if you are transporting a minor who is under 15 years old in the car, or your driving privileges are already suspended at the time that you are stopped. The penalties are also increased if someone is injured or killed in the course of an alcohol or drug DUI. Generally, the most severe mandatory minimum penalty will apply to a case when both an alcohol and a drug DUI are charged. The consequences of drinking while taking drugs can be devastating. Alcohol and drug DUIs are serious. A conviction can result not only in legal penalties and fines but also in a social stigma or difficulties obtaining or retaining a professional license or job. It is critical to retain an experienced Phoenix lawyer to craft your defense. Contact drunk driving lawyer James Novak at (480) 413-1499 or use our online form to set up an appointment. He represents defendants throughout the Phoenix area, including in Tempe, Mesa, Chandler, Gilbert, Scottsdale, and other cities in Maricopa County.